Congratulations Baby Messages – Here’s our collection of ways to say, “Congratulations on your Baby!” When friends or family have experienced the miracle of life with a newborn baby, you’ll want to have the right words to express your feelings. It’s an exciting time – these words will help make it even more memorable. A brand new miracle to call your own! Congratulations! Of all you great achievements, being a parent will rank #1. Congrats. Wishing you a future filled with love, joy and laughter with your new baby. Parenthood is one of the best journeys in life — enjoy the ride! God could not be everywhere, and so he made parents. Parenthood is one of those rare things in life that gets continually better with each passing day. Enjoy the journey. The gift that keeps on giving. Congratulations on your wonderful news! Babies are a gift from heaven. You must be special to have one of its angels. A sweet little treasure sent from above, a coo and a smile, wrapped up in love. Congratulations on your new baby! A Tip for the New Parents: there are three primary emotional stages of development for a baby at this early age: 1. About to cry. 2. Crying. 3. Just finished crying. Congratulations. We are so excited and happy for you! Congratulations! May your new little one grow strong, healthy and wise. Congratulations on the new addition to your family! At last, He/She Is Out! Congratulations! You Think It’s Over – But It’s Just Beginning. A brand new miracle to call your own! Tip: For some occasions keeping your Congratulations Baby messages short works well. Congratulations on the new addition to your family. Wishing all the best on your new bundle of joy. Congratulations on your new role as proud parents of a happy and healthy baby [ boy / girl ]!! We hope this is a wonderful time filled with lots of joy and happiness for your new family. Here’s to celebrating a new life. May the joy of parenting bring you a lifetime of laughter and happiness. We’re really excited that your new baby has arrived safe and sound!! May your new role as proud parents be filled with much joy and happiness 🙂 Lots of love! Welcome To Your New Baby Boy/Girl! We’re really excited to hear that your newest family member has arrived safe and sound!! May you be blessed with lots of loving memories. Wishing you all the very best with the safe arrival of your new baby [ boy / girl ]. May this time be one that you always cherish and can look back on with fond memories. Welcome To Your New Baby! A son is a beautiful gift from God who will proudly carry on the family’s name. Congratulations and best wishes! A son is mommy’s little angel and daddy’s little man. Congratulations on the birth of your baby boy! Congratulations on the birth of your newest football fan! We want to welcome your little boy into the world and wish him all the happiness that two hearts can hold. Congratulations on your new son! Little boys love to make messes but remember that a messy home is a home full of love! 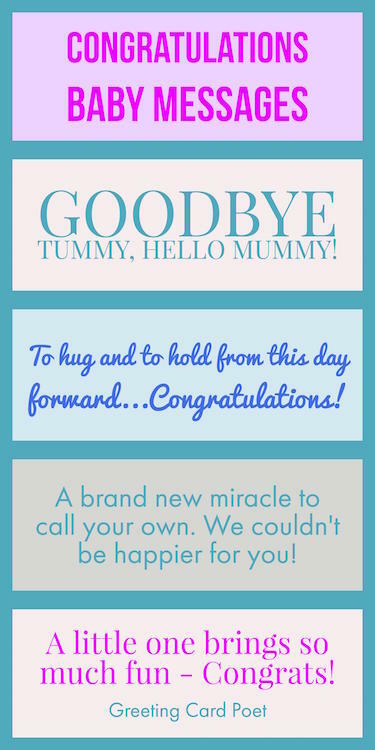 Tip: These Congratulations Baby messages can be used for photo captions, social media and more. He’s here! Ten fingers, ten toes and the most handsome little man you have ever seen! Best wishes on the birth of your son! Little boys are adventurous and exciting, bringing laughter, joy, and many muddy little footprints into your world. We want to congratulate you both as you enter parenthood. Best wishes! May your baby boy bring you much happiness. He is a lucky baby to have such a wonderful mommy and daddy. Congratulations on your new arrival! Little boys bring hope and joy into the world, spreading laughter and fun wherever they go. He’s guaranteed to keep you both on your toes! Wishing you all the best on your newest family member. Congratulations on the birth of your beautiful baby girl! There’s no doubt that she is going to be the most amazing and gorgeous part of your lives. Wishing you the best of luck with your new little princess. Your daughter is an adorable addition to your wonderful family. May her every smile make your world a little brighter. Congratulations. Be sure to cherish every moment that you have with your new lovely little baby girl. She is going to grow up quick. Congratulations on your little princess. Congrats on the arrival of your darling daughter as she fills your world with all things girly, sweet and pink! A wonderful new princess has just joined the family! What a beautiful moment to be a part of! Congratulations and wishing you all the best on you safe new arrival. Congrats on the birth of your new baby girl! May she bring you many years of sugar, spice and all things nice. A baby girl is the only other lady in daddy’s heart that mommy will never be jealous of! Congratulations and wishing you all the best with your new arrival. Congratulations on the safe and happy arrival of your new baby girl.We are excited to watch her transform into the amazing woman that she is sure to be! Tip: Some of these Congratulations Baby Messages work well as photo captions for Facebook and Instagram, or in scrapbooks or baby books. Now that your new daughter is here, your house will soon be filled with dolls, stuffed animals and imaginary characters that you have to invite to all the make-believe tea parties. Congrats! (Life quotes for babies, weddings and anniversaries events are our specialty. Check out the menu of quotes life options at the bottom of this page. If you have suggestions for our Congratulations Baby Messages, please let us know on the Contact page. Thanks! You’re on Congratulations Baby Messages.